Sturgeon Bay, WI July 15, 2017 – The Door County Land Trust (DCLT) is pleased to announce it has protected 120 acres of coastal wetland property in the Gibraltar-Ephraim Swamp State Natural Area. The property was acquired from landowner John Wehling, who wished to preserve the property’s wild and natural features. Acquisition of the Wehling property protects a mature white cedar swamp, a fragile and vital ecosystem that supports many rare or endangered plant and animal species, such as the dwarf-lake iris, red-shouldered hawk and bald eagle. The wetlands on the Wehling property are the headwaters of the Hidden Springs and Ephraim Creeks, which drain into Green Bay and provide a habitat for migrating birds and spawning fish each year. The Wehling property lies within the Gibraltar-Ephraim Swamp State Natural Area, a mostly contiguous tract of wetlands recognized by the state for its high ecological value. 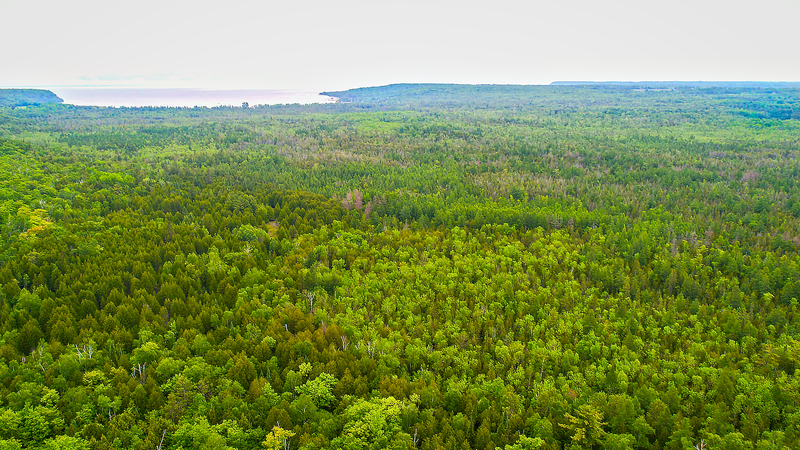 Stretching from Peninsula State Park to the outskirts of Ephraim, the Gibraltar-Ephraim swamp contains some of the best remaining coastal wetland habitat in northern Door County. The Land Trust, in partnership with other conservation organizations, continues to work to expand the protected areas within the swamp, safeguarding water quality and providing an undisturbed habitat for wildlife for generations to come. “Thank you to John Wehling for his vision in making a lasting commitment to the ecology and people of Door County,” said Tom Clay, Door County Land Trust Executive Director. “Every acre we protect is significant, but the ecological value of the Gibraltar-Ephraim Swamp is especially remarkable for the number of plant, fish and bird species that will benefit from this protection,” Clay said. The acquisition of the Wehling property brings the total area of land protected by the Door County Land Trust to nearly 7,800 acres. According to Door County Land Trust Director of Land Program Terrie Cooper, “The agreement marked a successful conclusion to an almost two year collaborative process between Mr. Wehling, with counsel and representation by attorney Mr. Timothy McCoy of Godfrey & Kahn, S.C., the Door County Land Trust, Todd and Nick LeRoy and grant funding through the Department of Natural Resources Knowles-Nelson Stewardship grant program and the US Environmental Protection Agency’s Great Lakes Restoration Initiative.” The Door County Land Trust will now steward and protect the land, maintaining its rustic and wild character. Due to the wetlands on the property, the Wehling property will be accessible on frozen ground in the winter through a 20 foot access easement off Townline Road. Year round you can access the Ephraim Swamp west of Hwy 42 at the Village of Ephraim’s Wetland Preserve through a series of trails and wooden bridges.